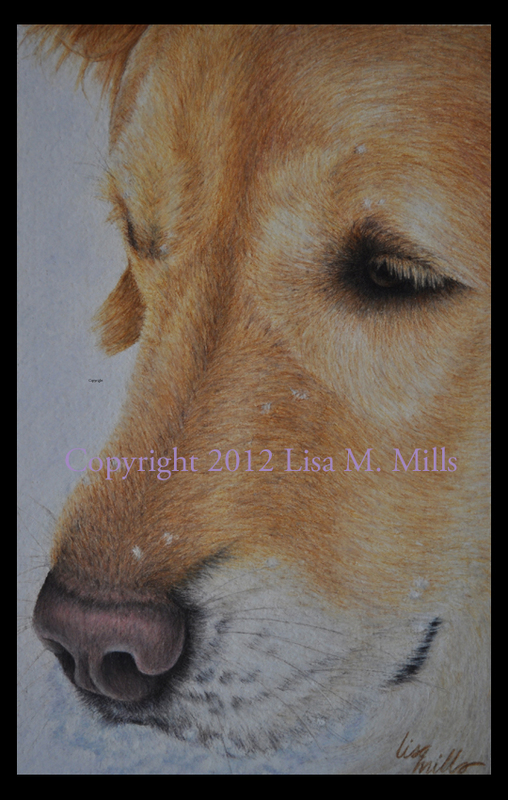 This entry was posted on November 15, 2013 at 2:38 pm and is filed under Uncategorized with tags animal art, colored pencil animal art, colored pencil animal artists, colored pencil art, Golden Retriever, Loss of a pet. You can follow any responses to this entry through the RSS 2.0 feed. You can leave a response, or trackback from your own site. Your artwork is beautiful, but it was certainly the subject that enticed me to read Lucy’s story. She had a wonderful happy life, and I truly understand your grief. I have a female Golden, also named Lucy. She has many of the same mannerisms you mention about your Lucy. She turned 8 years old in June of this year, 2013. She is my best friend, my buddy in everything that I do. Her unflagging joy in life and every new thing or person she discovers constantly makes me smile. I understand your pain and offer you real sympathy. Be consoled that she died so suddenly, so quickly, that although it was unexpected, it was so much better than having to watch her waste away in pain. I hope my Lucy is as lucky as yours was. You were a perfect human to her and gave her the best that a dog’s life can be. Thank you for writing this eulogy. I cried when I read it.